Hobbies: Songwriting and performing those songs, telling stories—be that on stage or just to friends—and cooking with my mom. Shut up, it makes me happy! Also, I listen to a ton of podcasts, attend as many concerts as I possibly can, and spend a great deal of time panicking over current political events. Pet peeves: When people let little discomforts spoil an entire experience. When people feel a need to complain constantly, even when there's nothing to complain about. The worst, though? When people don't have a sense of humor. Laugh, dammit! Three words to describe you: Self-deprecating, charming, and affable—though others would say "punchable." Nothing feels better than hearing your own music for the millionth time and still enjoying it. And even better, when other people hear your music for the first time and it makes them cry. You can't fake those kinds of responses. It's the best. Cheesy? Maybe. True? You bet, man. I have a few but I suppose Robin Williams is the most well-known one. When I was a little kid, Genie from Aladdin was my entire sense of humor. That wild, a-hundred-jokes-a-minute pacing, all the voices and wackiness completely dazzled me. As I got older, I got to appreciate all his other amazing roles and unabashedly nutty stand-up routines. I'm often told I'm too loud. I blame that entirely on Robin Williams. First would be my guitar because it gives me something I can focus on outside of the game. Next, one of those daily joke calendars because not only is it great for keeping track of time, but if your situation isn't providing many laughs, it's good to have a reliable way to find some. Finally, beard oil. I bought my first vile of this stuff about a year ago and it's the best feeling thing ever. Plus, it's really fun to respond to "Are you wearing cologne?" with "No, just beard oil." I've always felt like I related most to Stephen Fishbach, though I see a lot of David Wright in me as well. I'm a funny, nerdy, neurotic Jewish guy trying to make it in the entertainment business. I'm logical and smart (I like to think), but I've spent plenty of time crying in private. I've been dreaming of doing this for well over a decade. 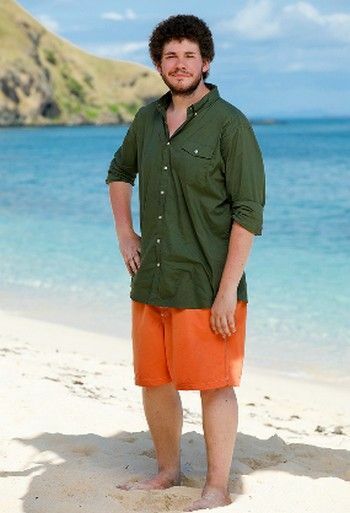 At this point, above all else, it's to prove I can do what I've been saying I could do since I was a kid: Win Survivor. Part pride, part sticking it to the kids who tortured me growing up. It's a "What have you accomplished?" kind of thing. I promise I'm not usually so vengeful! This sounds stupid, but I'm really easy to talk to. I want to set up my situation so everyone knows they can come to me to chat and get support despite any problems they're having personally or socially in the game. I'm a teddy bear, y'know? On top of that, I'm not a weakling. I can haul firewood and follow instructions when it comes to building shelters. I know how to make fire and untie knots and all that.